Soaking nuts & seeds… what and why? Some of the most convenient, nutrient dense foods available are nuts, seeds, grains, and legumes but there is one big issue… These foods need to be soaked and/or sprouted before we consume them. Why and what am I talking about? Well, these foods developed a protective coating to enhance their survival (so they do not sprout early in the wrong conditions), and that of the future generations of the plants they produce. This protective coating is in the form of phytic acid, and prevents the plant from premature germination and stores the phosphorous the plant needs to grow. So what’s the problem? Phytates (as they are called) are anti-nutrients that block proper absorption of iron, zinc, calcium, magnesium, copper, and other minerals – all of which are critical to our health!! Phytates bind tightly with minerals, and are only released when planted in warm, moist, and slightly acidic soil. So in order for us to absorb all of the wonderful nutrients we hear about from these foods, we need to soak the phytates away… create “soil like conditions” (ie water with salt)… otherwise we are not able to gain much of the nutrition from the actual food, nor absorb minerals from other foods we are eating. How to soak? Place the amount of nuts, seeds, grains, legumes, etc you need in a jar, bowl, or large glass and add double the amount of clean filtered water as well as a teaspoon of salt. 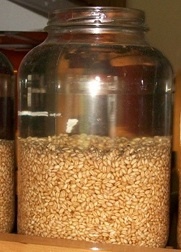 After soaking for at least 8 hours, the nuts, seeds, etc need to be rinsed in pure clean water, until the liquid runs clear. At this point if you have soaked almonds for example, you can either eat them straight away, or make a nut milk out of them (toss them in the blender with a cup or so of water), or dry them until crispy in a dehydrator (under 110-115 degrees Fahrenheit) or in your oven on the lowest setting for a few hours. You can also sprout what you have soaked. Think bean sprouts in Asian restaurants- which are typically mung bean sprouts, and are very easy to make at home. The process of sprouting produces vitamin C and increases the content of vitamins, including vitamin B, B2, B5 and B6. Carotene (which is converted to vitamin A), increases dramatically… sometimes eight-fold in sprouted foods, as well as chlorophyll! The vitamins and minerals mentioned above are more easily digested, and assimilated in soaked nuts, seeds and grains – and can lessen the “stomach discomfort” experienced with some beans and legumes. Many also believe that when soaked and sprouted foods contain the “life force,” a more powerful source of nutrition as well as a connection with the earth. Check out more here: Plants Bite Back – Weston A Price Foundation. and here: You Are What You Eat! : Grains 12/4/04.